Each year over 20,000 individuals venture up to Alaska to work in the fishing industry. A large percentage of these people have no previous fishing industry experience. That’s because, for most of these jobs in Alaska, all you need is a desire to make lots of money and a good work ethic. Alaska has an awful lot to offer. The scenery is breathtaking. The people are very friendly and you have the potential to make a lot of money in a short amount of time. 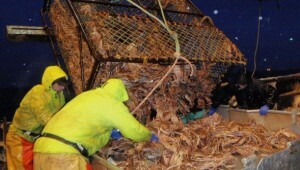 Hauling King Crab in Alaska. But, the Alaska fishing industry is also a very complex industry. In fact, you have over fifty individual fisheries taking place through the state of Alaska. Each fishery has specific details about its timing, its harvest method, its processing location, and it’s historical and projected harvest volumes, that can play a significant role in how much a person earns in a season in Alaska. We strongly believe that having a general understanding of the whole industry will greatly enhance an individuals potential to have a successful season working in Alaska. Luckily, we have the perfect resource to help bring this complex industry into an easy to understand format in our website, AlaskaJobFinder. Not only will AlaskaJobFinder educate you on the whole Alaska fishing industry, it will also help you navigate through the potential tricks and traps of the industry and provide you with proven strategies to help you land a job in Alaska and help you maximize your earnings. Becoming a Member of AlaskaJobFinder is very reasonably priced, starting at only $3.95 for a five-day membership. To find out more, click on the links below.